This is a list of the most commonly cultivated varieties of sweet corn, and the approximate number of days from germination of corn plant to harvest. Unless otherwise noted with the term open pollinated, all varieties are hybrids. Genetically modified varieties only available to large-scale commercial growers, such as Bt corn and glyphosate resistant corn, are not listed. The oldest type of sweet corn, which contains more sugar and less starch than field corn intended for livestock. Tends to be heartier in respect to planting depth, germination and growth than other types. Begins conversion of sugar to starch after peak maturity or harvest, and as such is best when harvested and eaten immediately. Multicolored varieties are usually at their sweetest when the mature color just starts to "blush" on the kernels. Contains even more sugars in relation to starch than su types, and as such is able to retain sweetness for 2 to 4 days with proper refrigerated handling. Somewhat less hardy than su types. Is known as a "tender" kernel and as such does not lend itself to mechanical handling. Does not require isolation from su pollen, although it is preferred. Some seed catalogs don't distinguish the heterozygous se (one se parent) and homozygous se (two se parent) varieties, but if they do, the homozygous se varieties will be labeled either se+, (se se) or SE. 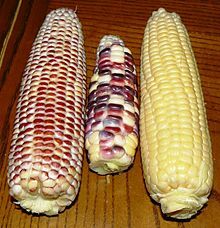 The husked ears of three cultivars: pictured left to right are 'Ruby Queen', 'Painted Hill' and 'Bodacious'. Supersweet or shrunken-2 types have four to ten times the sugar content of normal sugar (su) types and with proper handling is able to be stored for up to 10 days. Less hardy than even se types, requiring higher germination temperatures, precise planting depth and isolation from all other corn pollen for optimum results. The name derives from the shrunken, shriveled appearance of the dried kernel which is low in starch. Synergistic varieties combine differing genetics on the same ear. The first varieties developed of this type have 25% sh2, 25% se and 50% su kernels on the cob but now different combinations are possible. There is an increasing number of brand names and trademarks that cover specific genetic combinations under this general type. However, a common trait of all sy types is that isolation from other su and se varieties pollinating at the same time is not required, though isolation may still be recommended for maximum sweetness. Varieties of the augmented supersweet type combine multiple gene types on top of sh2. These varieties have 100% of the kernels containing the sh2 gene, but also have se and su genes in some portion of the kernels. The Mirai varieties for example have sh2, se and su genes in all kernels. The augmented supersweet varieties have tender kernels like the se varieties. Therefore, mechanical picking is not recommended. As with other supersweets, these varieties must be isolated from su, se and sy types pollinating at the same time to prevent starchy kernels. Note: The Xtra-Tender varieties have a series number that indicates the approximate days to harvest, indicated with dd in the numbers below. For example, Xtra-Tender 282A would have maturity of about 82 days. ^ a b c d e f g h "Crookham SE/SU Series". Retrieved 2012-01-16. ^ a b c d e f g h "Rogers Fresh Market Sweet Corn". Retrieved 2012-01-16. ^ "Golden Bantam". Retrieved 2012-01-10. ^ a b c d "AAS Winners". Retrieved 2012-01-16. ^ "Mississippi State University Extension Service -". msucares.com. Retrieved 19 September 2018. ^ "Sweet Corn Production" (PDF). Oklahoma Cooperative Extension Service. Retrieved 5 September 2012. ^ Hallauer, Arnel (2001). Specialty Corns, 2nd Ed. CRC Press. p. 171. ISBN 0-8493-2377-0. ^ "Honoring Plant Breeder Alan Kapuler". Retrieved 2013-03-13. ^ "Hookers Sweet Corn". Retrieved 2013-12-15. ^ "Painted Hill Sweet Corn Seed". Retrieved 2014-01-09. ^ "Double Red Sweet Corn". Retrieved 2019-01-05. ^ a b c d e f g h i j "Harris Moran Sweet Corn". Retrieved 2012-01-16. ^ "Bon Jour Bi-color corn". Retrieved 16 Feb 2017. ^ "HGIC 1308 Sweet Corn - Clemson University". ^ a b Levey Larson, Debra (August 2003). "Supersweet sweet corn: 50 years in the making". Inside Illinois. University of Illinois at Urbana-Champaign. 23 (3). Retrieved 2009-12-30. ^ "Abbott & Cobb Sweet Corn Yellow sh2". ^ "Abbott & Cobb Sweet Corn White sh2". ^ "Abbott & Cobb Sweet Corn Bicolor sh2". ^ a b c "Crookham SY Series". Retrieved 2013-01-27. ^ "Honey Select sweet corn". ^ a b c "Mirai Hybrid Varieties Page - Yellow Hybrids". ^ "Mirai Hybrid Varieties Page - White Hybrids". ^ a b c d "Mirai Hybrid Varieties Page - BiColor Hybrids". ^ "Corn, Sweet American Dream | All-America Selections". all-americaselections.org. Retrieved 2017-09-18. This page was last edited on 5 April 2019, at 14:48 (UTC).